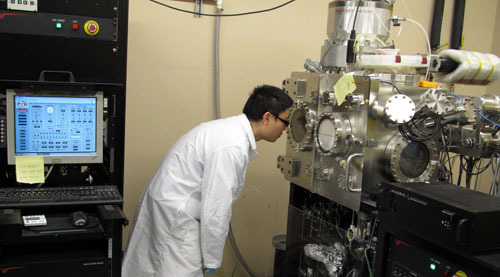 An ion beam assisted deposition (IBAD) system is available with a six-pocket e-beam evaporator for deposition of multiple films of different layers without breaking vacuum. The system consists of a highly flexible r.f. 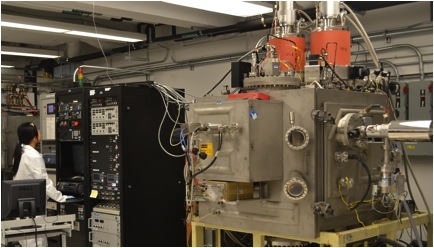 ion source, in-situ reflection high energy electron diffraction (RHEED) capability, and a reel-to-reel substrate tape handling system. The reel-to-reel system enables continuous deposition of moving tapes which is very beneficial for conducting multiple deposition experiments under different conditions in the same run as well as to fabricate longer sample lengths. A second ion beam assisted deposition system is also available with two 22 cm long, linear r.f. ion sources for ion beam sputtering and simultaneously ion beam assist. On-line RHEED, flexibility of changing the ion beam incidence angle and deposition flux incidence angle are few features of this system. This system also has reel-to-reel tape handling and is fully automated and recipe driven.